f The Bugbytes: Explore - New Progressive Challenge at PCP with Free Image! Explore - New Progressive Challenge at PCP with Free Image! Michelle here from Lady of Leisure Ink, thanks so much Pam for having me over to visit. Today marks the beginning of a new progressive challenge over at Paper Craft Planet, the challenge lasts through 14th September so you will have plenty of time to play along. This is the free image from Sassy Studio Designs available this month, and the theme is 'Stempunk'. 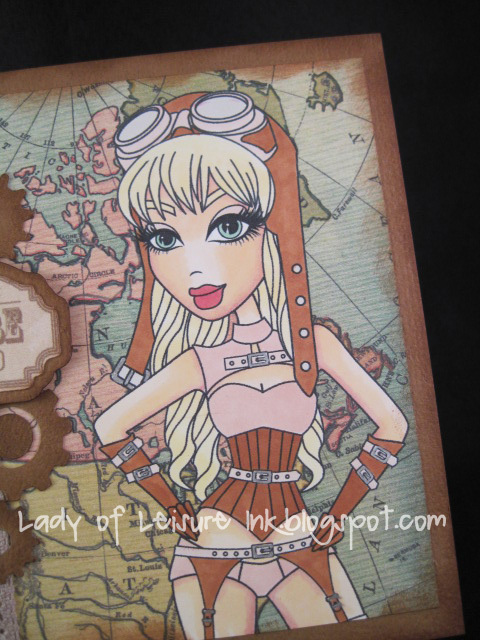 I used my Cameo to print n cut the image and then coloured her with ProMarkers, I also printed the background paper and cut the 'cogs and label with my Cameo. Hop on over to Paper Craft Planet to check out all the details and see a few inspiring projects from the DT. Great card. Thanks for the information.